LiveGrade PRO supports all models (e.g. 19″ rack model or rugged model) with a NID Chip firmware higher or equal to 38.16 and for the A065 Chip at least the version 2.35. All installed licenses on your Pluto device don’t matter to LiveGrade Pro. Our support for Pluto works independent from your installed licenses.So you don’t need a CDL license for the CDL grading mode in LiveGrade PRO. So no extra license fees for you with using LiveGrade PRO! Where to find your Firmware No. 1. 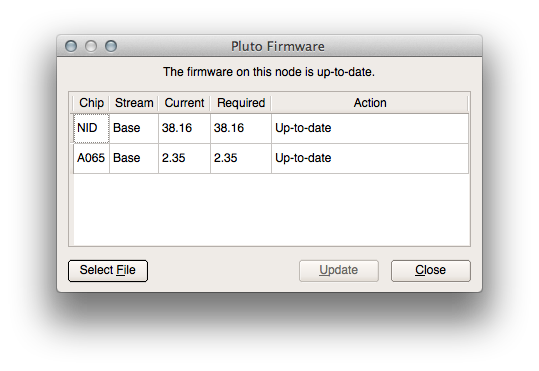 To find out the actual firmware of your “Pluto” device please open up your Pluto Software.2. Click in the Pluto Menu on “Node” and select (see fig. 1) “Firmware” (see fig.2) to open up the information. For more information how to connect your Pluto see Setup Pluto. To update your Pluto device you need to have at least the version 1.27 for more information please check this knowledge base entry.